When Data Scientists look for jobs in a hot career market, your company needs to stand out. Here’s what you need to succeed. “Data scientist” is currently one of the most sought-after positions in the United States. Companies in nearly every industry have come to understand the opportunities that data capture and analysis offers, and the result has been an influx of employers looking for in-house data scientists. Positions in data science require a unique set of job skills that many professionals simply don’t possess. The level of programming knowledge, understanding of statistics and business sense make for a difficult position to fill. Because of this, many businesses find it difficult to hire appropriately for the position of data scientist. Even once hiring managers are able to determine what skills they need to assess in a potential candidate, they then face the challenge of attracting the right professionals. So, what are today’s top data scientists looking for in a career? Keep reading to find out. According to recent estimates, we create approximately 2.5 exabytes of data every single day. However, we aren’t processing, storing or using most of this data efficiently. The bulk of big data is currently going to waste. While it’s important to use all this information to our advantage, it’s equally imperative for companies to keep the interest and attention of their new data scientists. Offering competitive pay and benefits is a good start, but most experts in the field are looking for something more worthwhile. Companies are achieving this goal through various means. Scientists who can create flexible daily schedules, or those who are allowed to work remotely, will often put in additional time in the face of tight deadlines or exciting breakthroughs. Likewise, those who are given the freedom to pursue their own research and directives are often more than willing to put in overtime whenever possible. Since big data processing and management can be a tedious and monotonous job, and because it’s not an easy opening to fill, companies want to keep their data scientists for as long as possible. As a result, many companies hire from within. Getting one’s foot in the door as a project manager might ultimately lead to a role as a data scientist or engineer, so many novices in the field will eagerly accept entry-level positions that show a potential for advancement and progression. Our modern workforce is all about teamwork. With a greater willingness to work with their peers than ever before, most data scientists are pursuing opportunities that involve team-based operations. Depending on the size and scope of your data research initiatives, it might be too much for one IT expert to handle. In that case, building a dedicated team of data scientists is crucial to ensure timely progress and to produce quantifiable results. 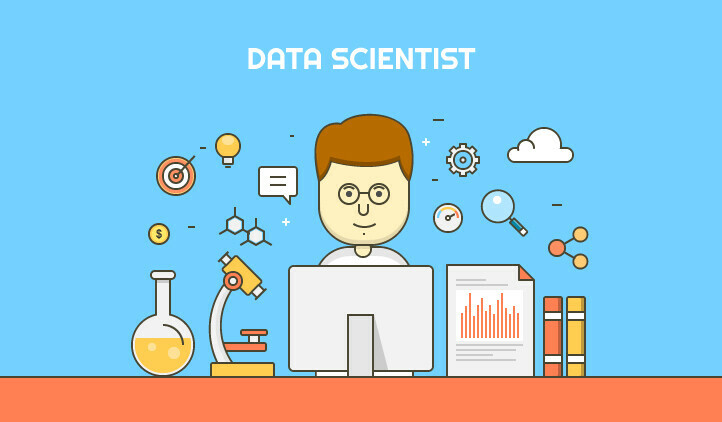 Data scientist: A critical component of any data science team, it’s the data scientist’s job to perform research, collate information, analyze data and generate predictive models. Designer: The designer’s job is to facilitate accessibility and bolster the user experience by creating the interface of any proprietary programs or apps. If it wasn’t for the designer, all of this data would be difficult – if not downright impossible – to access and interpret. Data platform administrator: This role is well-suited for former data engineers who specialize in distributed technology. Most data platform administrators maintain comprehensive knowledge of cluster management and cloud computing architecture. Data solutions architect: Another job that is often filled by data engineers, it’s the data solutions architect’s job to establish data requirements and target specific directives. Data engineer: Although this title is sometimes used interchangeably with the term “data scientist,” they’re two different disciplines altogether. Whereas data scientists specialize in analyzing and managing complex codes and algorithms, data engineers spend much of their time designing new utilities, frameworks and architectures to support data processing. Project manager: Project managers are common across many industries and professions. In this case, the individual needs to have a strong knowledge of general IT as well as advanced concepts in networking, cloud computing and big data management. When working as a team, a group like this can make short work of nearly any ongoing research, collation or interpretation efforts. Instead of assuming all this responsibility independently, today’s data scientists want to share the credit with their peers as much as possible. Not long ago, big data was the exclusive territory of the most prominent IT brands. There weren’t as many experts in the field 20 or even 10 years ago, and many small companies functioned perfectly fine without using big data. But this isn’t the case anymore. Even the smallest startup companies and entrepreneurial ventures now rely on big data to execute their business models, locate specific demographics and ensure long-term success. Businesses leave almost nothing to chance anymore, and much of this transition is tied directly to the big data boom. Perhaps above all else, data scientists want to work with a company that offers job security and stability. Many professionals in the niche realize how few openings exist in the field, so they’ll be pursuing long-term assignments whenever possible. Companies that can accommodate this need and provide guaranteed work will likely find it easier to fill roles in big data management, as opposed to those that only need to complete a one-time project. Although the big data boom is still in its earliest stages of development, experts agree it has the potential to transform the way we do business from this point forward. But its applications aren’t always readily apparent. It takes a sharp mind, extensive knowledge and the ability to translate stats and figures into meaningful, relatable reports — and that’s precisely where the professional data scientist comes in. Kayla Matthews has been writing about smart tech, big data and AI for five years. Her work has appeared on VICE, VentureBeat, The Week and Houzz. To read more posts from Kayla, please support her tech blog, Productivity Bytes.